Trade between BRICS allies China and Russia has increased about 30 per cent in the first quarter of 2018, Chinese officials said. The uptick in exchange between the two economic giants will take their trade to $100 billion in 2018, Ministry of Commerce spokesman Gao Feng told reporters on Thursday. Gao said that this year’s trade volume would surpass last year’s which was $84 billion – a 21 per cent rise over 2016. In the past few years, multi-sector ties have been strengthened between China and Russia. Last week, Russian oil giant Gazprom said that the Power of Siberia natural gas pipeline is 75 per cent complete and runs over 1,600 kilometers. 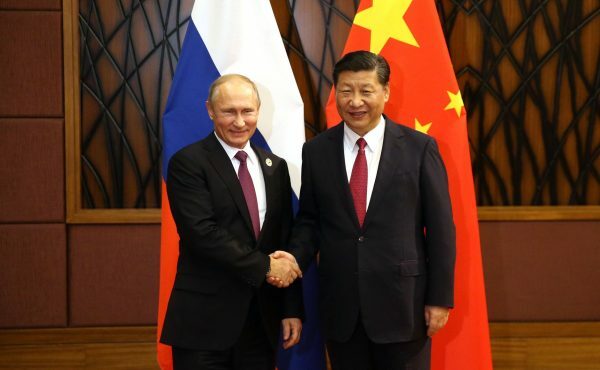 In May 2014, Vladimir Putin and Xi Jinping singed a landmark $400 billion gas deal under which Gazprom will supply the China National Petroleum Corp (CNPC) 38 billion cubic meters (BCM) of natural gas every year for 30 years. The project will strengthen Russian-Chinese energy cooperation, and defines the main terms of the natural gas supply from Russia to China through the East-Route, including the cross-border section of the gas pipeline across the Amur River (the Heilongjiang River in China) near Blagoveshchensk (capital of the Amur region in the Russian Far East) and China’s border city of Heihe. The pipeline has geopolitical and strategic value as it means Russia’s energy export targets are now eastward, and China can wean itself off the polluting coal as an energy supply. The deal has brought both countries, BRICS members, closer and has been a massive boost to Sino-Russian ties even as Russia struggles with EU and US sanctions over Ukraine. Meanwhile, Gao said that both countries are likely to benefit from the fifth China-Russia Expo in July and the China International Import Expo in November.